Abraham Adams is an artist based in New England. His books include Before (Inpatient Press, 2016) and Nothing in MoMA (Sternberg Press, forth. 2017, with an introduction by David Joselit). He is the founder of Time Farm. “Say ‘Ah’” was published as part of Triple Canopy’s Immaterial Literature project area, which receives support from the Andy Warhol Foundation for the Visual Arts, the Brown Foundation, Inc., of Houston, the Lambent Foundation Fund of Tides Foundation, the National Endowment for the Arts, the New York City Department of Cultural Affairs in partnership with the City Council, and the New York State Council on the Arts. 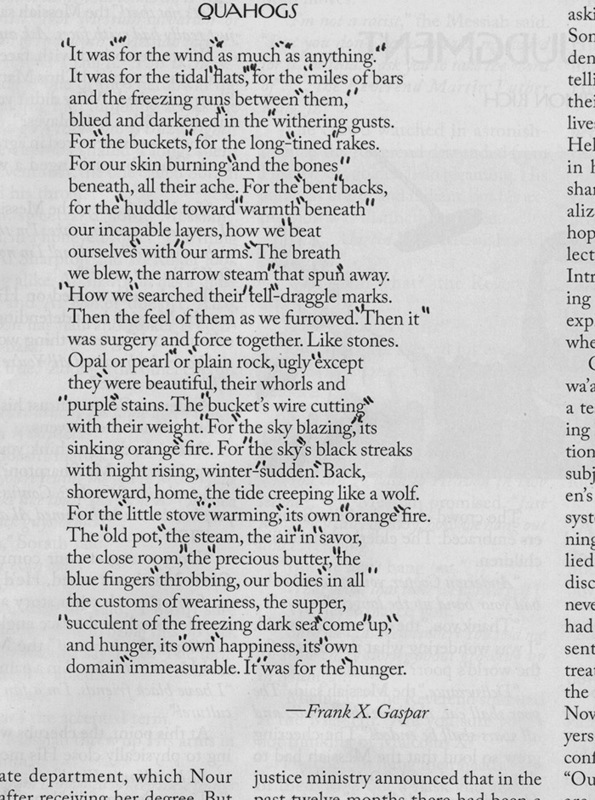 “To say Ah is to affirm you have been created in the image of the poet.” On New Yorker poetry and language without history. Next to the couch in my childhood living room there was a wicker magazine rack. It held the New Yorkers that came in the mail, its capacity about thirty. The overflowing copies gathered in twos and threes on tabletops and counters. Growing up, I took the magazines’ ubiquity for granted. I would read the New Yorkers occasionally, but I actually experienced them as furniture—an unexplained precedent, a kind of hearth god. I think I started reading the poems in each issue because they offered interruptions in what was otherwise a practical eternity of articulation. But somehow I do not remember a single individual poem from that time—only a vague series of lineated islands, all with the same sound. The New Yorker prevailed in the familiar households of my small Vermont town. Friends’ parents and my mother’s colleagues at the local newspaper talked about it at parties, or at least they repeated things I knew them to have first encountered in it, much as I would sometimes hear them repeat phrases verbatim from NPR. These conversations were about politics, fiction, or perhaps music—but never poetry, as if the New Yorker’s poems were less important even than the covers, certainly than the cartoons. In conversations reproducing New Yorker content, omitting poetry was customary. I live in New York City now, and maybe because I was once a poetry publisher, people employ me as a confessor: I try to keep up with the New Yorker, but I never really read the poetry! I probably should. I have had this conversation hundreds of times. No, I always reassure the repentant, I don’t really read the poetry section either. This exchange seems to inoculate us against the magazine’s notion of poetry—but why might we require such an inoculation? For many years I never had a conversation about a single specific poem in the New Yorker, but I had heard and read a certain amount about the phenomenon of the “New Yorker poem.” I think of this “New Yorker poem” as a very adept, modestly cathartic, confident block of text of a certain size. Prose wraps nicely around it, having the look of a native habitat. According to the critic David Orr, it’s “basically an epiphany-centered lyric heavy on words like ‘water’ and ‘light.’” The poet Michael Blumenthal once deployed the poem’s own form to define it, a gesture meriting a longer quote. quotidian and blemished and loved by everyone. This parody describes a decorous, professional poem whose vocabulary and syntax are continuously elevated. The poem builds toward a climax and indeed climaxes, in an annoying coalescence of sound and meaning. Reading it, I think of the old men I have seen on the subway reading the New Yorker, wearing fastidious but inexpensive white-collar outfits; young women in high-waisted slacks who carry tote bags; young men who roll their pant legs up; vivacious professorial sourpusses. Whether Blumenthal’s poem is in the image of these types or they are in its image is difficult to say. There they sit, enjoying the prose’s rigor, its wry efficiency; appreciating its plainspokenness while awaiting the occasional frisson of some unusual mot juste they learned when they were studying for the GRE. But there on the train and practically everywhere else, you can be sure they are also ignoring the poetry. New Yorker poetry projects such awkward shibboleths; to read it guilelessly is to (guilelessly) assimilate to its intellectual and cultural demands. It is poetry that “assumes both a community of reference and of verbal intelligence on the part of its readers.” But this quote, from an interview with Howard Moss, who in 1950 became the New Yorker’s first dedicated poetry editor, is not about New Yorker poetry or poetry in general, but rather about light verse in particular. Moss loved doggerel. “Its disappearance is a reflection on the verbal level of a community,” he wrote. He viewed American literacy as in decline and literate readership as a community in dissolution. He said that “when people are unsure about language, light verse is in danger of disappearing … light verse requires an audience.” He found this unsureness undesirable. He desired a certainty predicated on knowing one’s audience as one knows oneself. 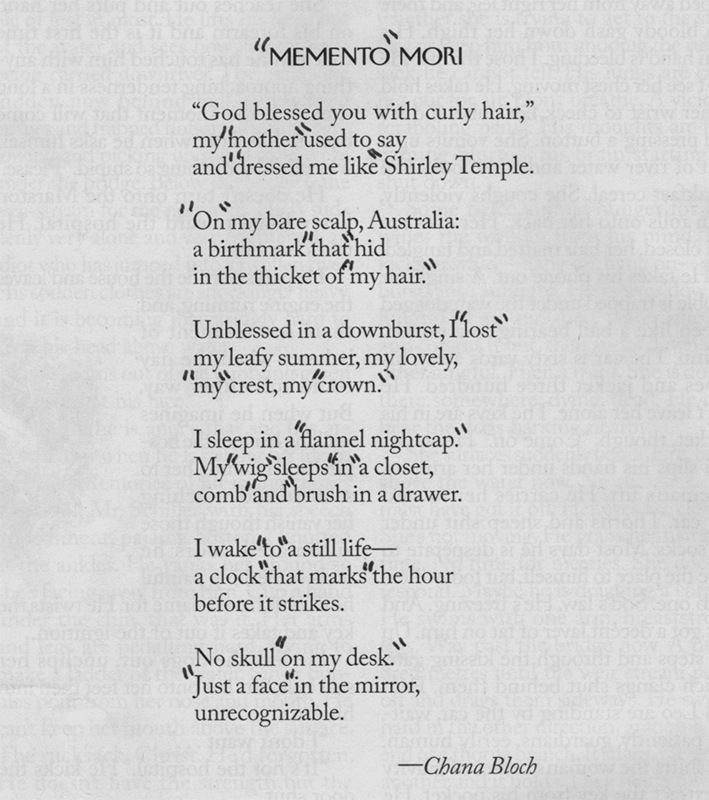 The New Yorker published exclusively doggerel, no other genre of poetry, for its first few decades. The middle of the twentieth century marked the point when the magazine shifted to the serious literature with which we now associate it, under the directives of the editor-in-chief, William Shawn, appointed in 1952, and the influence of the founding fiction editor, Katherine White. Moss stewarded the transition in poetry. What resulted bears traces of an ethic he articulated best while speaking of his own writing: to “escape the classification of light verse and yet pay homage to it … means creating an imaginary audience.” New Yorker poetry has had a varied life—it cannot actually be pinned to water, wildflowers, or any particular metrical structure—but I think it does possess one unlikely continuity: inventing an audience in its own image. It expects a considerable national circulation, but this will come from persons who have a metropolitan interest. Thus the New Yorker, named for its ostensible audience while actually addressed to the entire nation, would sell an image of a reader with which actual readers were invited to identify—an imaginary person who made the experience and concerns of the urban elite inhabitable by the provincial. Poetry’s role in this venture was to refine the magazine’s general “assumption of enlightenment” into a performance of an enlightened perspective. Although the disposable comedic prose and poetry of the 1920s New Yorker would be unrecognizable to many of its present readers, I look to the early doggerel for the way it invented an idea of community on which New Yorker poetry still relies. Meanwhile, the form reiterates how much narrator and reader have in common—verse as a parlor amusement. Doggerel was supposed to be funny, and as a voice of “gaiety, wit, and satire,” the New Yorker struck a distinct contrast with modernist art, in which traumas of the Great War were finding more direct expression. The year of the New Yorker’s founding, 1925, was also the year of the publication of Mrs. Dalloway and The Great Gatsby, novels whose critical portrayals of interwar high society were diametric to the New Yorker’s exuberant impunity. 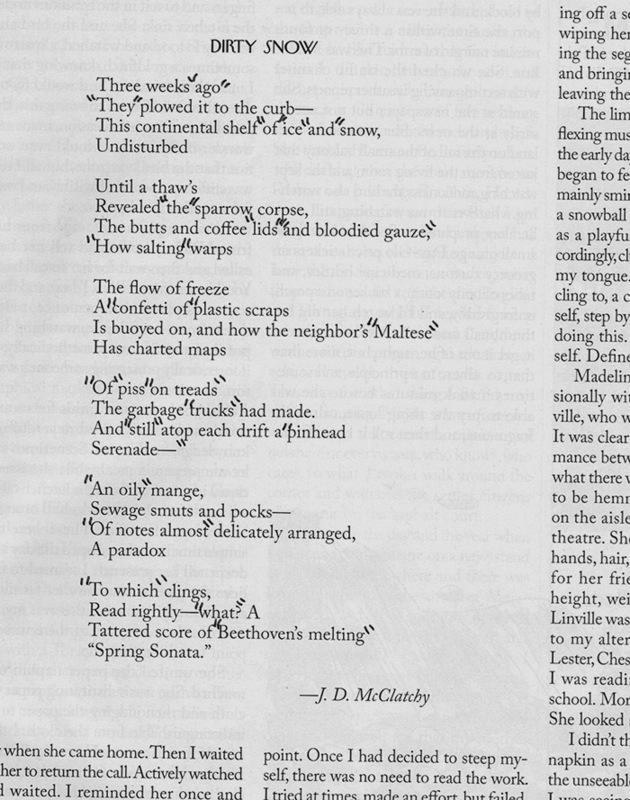 Throughout the Great Depression and the Second World War, the magazine disseminated the happenings of the country’s de facto capital to an imagined readership so sophisticated as to already be in the know, and to readers throughout the country who, in part through poetry, conceived of themselves as part of that imagined readership. 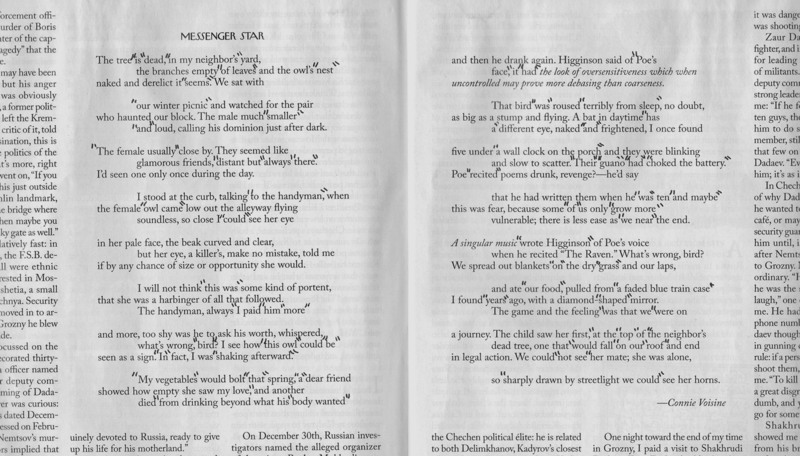 The publication of serious poetry within the New Yorker’s pages began in fits and starts in the years preceding World War II, and by the 1950s the magazine was seeking out poets in the modernist lineage who wrote accessible, formalist verse—serious doggerel, if you will.3 From this point, what the poems offered would no longer be the simple perspective of an elite person but rather the experience of a literary subjectivity the upper class had come to value. The original identification the poems cultivated, between reader and narrator, evolved into one between reader and poet. What remained was a certain requirement about how language works, a vestige of light verse that still defines New Yorker poetry. This idea of language is more than just a basis for sympathy between the reader as subject and the author; it is the means by which the reader vicariously adopts the author’s subjective experience, which only happens if language works perfectly. The poems I read in the New Yorker when I was a kid seemed to have a particular sound, a tone at once affective and stylistic, which I now recognize as the result of the constraint that the meaning of words be transparent. So they managed to be simultaneously plain-spoken and rhetorically high-flown (“difficult,” but only “delightfully” so); they narrated personal experiences in a sometimes loose but usually audible meter; they tended to end with a flourish that took me some time to define. Our love calls tiny as a tuning fork. warm still in the fire of your care. the blank, white, glittering sublime. sweeping the bright rim of the extreme. the / cheap shot is parted. it was nothing to you where were you. from the cypresses, the mountains, the olives turning silver. 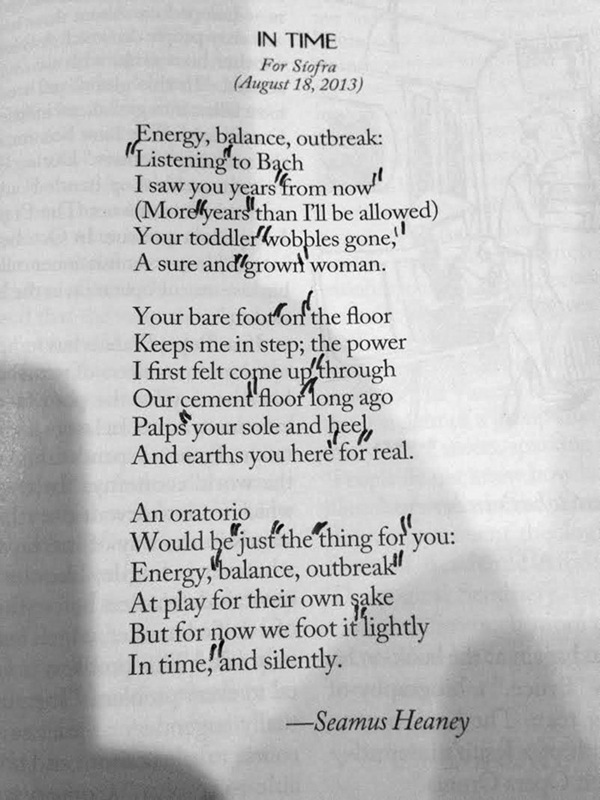 To aggregate these codas prolongs, while abstracting, a feeling that they all induce, a kind of petite sublime: an “Ah.” New Yorker poet Robert Pinsky tells us that reading poetry out loud is “an essential pleasure,” and if you’ve ever heard a New Yorker poem read aloud to a group of people, you may recognize the Ah that the poem’s coda often elicits: a brief moan, a soft grunt, an aspirated hum. Ahhhh, hmmmmm, hunnnhhhh. It is an expression of the audience’s union with the experience of subjecthood that the poem exists to narrate. To say Ah is to affirm you have been created in the image of the poet for a moment, as if the poem were a quotation from your very own mind. barely rippling as they pass. Here heroic masculinity establishes itself through some Robert Lowell–style formalism and classical allusions, as the poem gives us the war through the mind of Tom Sleigh, embedded poet. If I were reading aloud, the aural slickness of Barely rippling as they pass would signal for my audience that the transfer of his experience was complete: War would be beautiful after all, given enough clear-eyed determination, wisdom, sense of cinema. What would it be like to be able to think like that all the time, to live one continuous poem? For Trillin’s satire to work at all, he must be implicated in the “we” of the poem. … And who are “they” in the poem? It was this word, in the poem’s very first line, that made me realize that I, as a Chinese-American reader, was excluded from it. Here it was: “we,” the community of reference that New Yorker poems have always assumed, a group that the reader must assimilate to for the poem to make sense at all. Suddenly its actual demography was overt: the upper-middle-class white man, moreover a New Yorker who thinks that he is the New Yorker. There, that looks nice. It felt good, too. I enjoy adding quotation marks to New Yorker poems. And my enjoyment is, of course, connected to the way these marks disrupt the meaning of the words—which is to say they indicate a meaning somewhere else, a source, because if nothing else, quotation marks indicate an attribution to a source. Here I have added them at random, pointing to nowhere in particular, a disruption of the supposedly transparent relationship between a word and its meaning. Now that I see the marks on the page, their invocation of dialogue makes me think that the reason the coda is important is to remind us that we are listening to a voice, a particular person’s sophisticated consciousness. The poem’s performance of eloquence seems to represent a subject who thinks in poetry. In the process of marking, I have interrupted my ability to experience the poem as a thought, to live in it. I want to do this because I do not think that the transmission of experience via language is possible. New Yorker poetry invites an experiential communion in language between author and reader; it ostensibly creates a “community of reference,” a sense of we between momentarily identical subjects. This sense of shared experience has come to define a great deal of poetry beyond the New Yorker. But experience is, as Emmanuel Levinas wrote, “non-transferable, like a responsibility.” In this view, poetry might serve to relate author and reader, allowing them to have significantly related—but fundamentally separate—experiences. The adults of my childhood discussed New Yorker prose because they found it interesting to reproduce that subject matter. Maybe the reason they didn’t talk about the poetry is that they shared my aversion to the idea that language is capable of reproducing someone else’s life in one’s own mind. Maybe all those who ignore New Yorker poetry do so because they are intuitively bored with this concept, they don’t really believe that’s something poetry can do. It is not my task here to spell out the alternative, but I can say that the writing I like might not be so affected by the addition of random quotation marks, because in various ways it effectively adds its own gestures toward a source it doesn’t pretend to control. To me this means purposefully submitting to a delay between word and meaning, in recognition of the inevitability that the author’s sense of words’ meanings will differ from her reader’s—that such differences are, collectively, what language is. Many poets already know this; these are poets for whom all language is already in quotation marks. I wonder if the New Yorker could ever publish such writing. One way would be to make me their poetry editor. But that is what I have tried to show here, that I already am. 2 Porters used sawdust to freshen floors and absorb moisture prior to sweeping. 3 For more on the evolution of the magazine in this period, see Ben Yagoda’s About Town: The New Yorker and the World It Made (2000), which details the relationship between the editors and various strands of modernism and types of modernists. 4 These are the endings of poems by Seamus Heaney, Jorie Graham, Philip Levine, Mary Oliver, Seamus Heaney, John Ashbery, Billy Collins, W. S. Merwin, Derek Walcott, and Donald Hall.